A portable hot tub is the only appliance you bring home, connect to 220 Volts, fill with water and then climb inside. When you're sitting in water up to your neck, electricity in or even near the water is a bad thing and should be avoided. Ground and electrical connections in a portable hot tub are critical for soaking safety but these connections can corrode from exposure to moisture and chemicals. The vibration you can feel when your hot tub jet pumps are running can also cause ground and electrical connections to loosen over time leading to risk of electrical shock or even electrical fire. Loose or corroded ground connections can cause electrical shock. 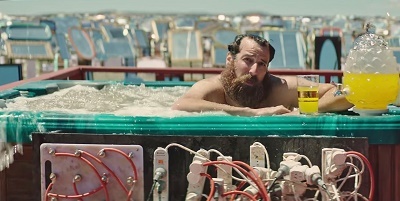 This Budget Direct commercial was banned because the hot tub scene was considered too risky and it "portrayed a serious safety hazard in a trivial way" that put "young viewers lives at risk". Click to watch Captain Risky's Hot Tub Temple of Risk! 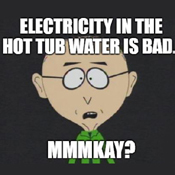 If watching a television commercial about electricity in a hot tub is "too risky" imagine what real electricity in your real hot tub can do! Loose or corroded electrical power connections can cause electrical fire. Schedule a Routine Hot Tub Service to help prevent electric shock & electrical fires! Like a worn out plug on an extension cord or a worn out receptacle in the wall, a loose electrical connection in your portable hot tub can become hot enough to start an electrical fire. 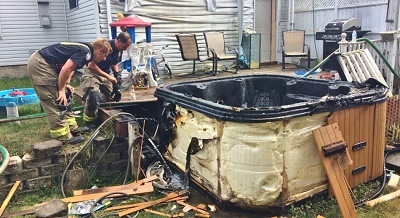 Fire in a portable hot tub can be difficult to extinguish once all the various plastics start to burn and all that burning plastic gives off thick clouds of noxious and highly toxic smoke. Help prevent hot tub electrical fires and electric shock by scheduling a Routine Hot Tub Service at least once a year which includes inspecting, tightening and testing with a meter so electrical and ground connections are verified safe! Pour an ounce of prevention into your portable hot tub at least once a year. Schedule a Routine Hot Tub Service. Your portable hot tub doesn't require a permit but installing the wiring that connects it to your house does require an electrical permit and an inspection. If you installed a new circuit breaker or new wiring for your new hot tub you or your electrician were supposed to file an electrical work permit and schedule an inspection to ensure the work was done to code and to ensure your hot tub is safe. Electrical permits ensure projects comply with the minimum standards that help safeguard life or limb, public health, property and welfare. No electrical wiring, device, appliance, or equipment shall be installed within or on any structure or premises nor shall any alteration, addition, or replacement be made in any existing wiring, device, appliance, or equipment unless an Electrical Permit has been obtained for the work, except as exempted as stated below. Unfortunately, the person who wired your hot tub may not have been a licensed contractor unless you personally checked and verified their credentials. "Unlicensed contracting is part of California's estimated annual $60 to $140 billion dollar underground economy. These individuals do not pay taxes, have insurance or bonds." If your hot tub was hooked up by the delivery crew... Odds are pretty good they weren't licensed electricians or... they woldn't be moving heavy hot tubs for a living. If your hot tub was hooked up without a permit or inspection, odds are also pretty good your hot tub is not wired to code. Some code violations are minor and technical but others can be serious and hazardous (like electricity in your hot tub water). Electric code violations in your hot tub can mean serious shock hazards for bathers but the primary purpose of the electric code is to prevent electrical fires. Aliquam viverra, sem ut accumsan cursus, turpis nisl ultrices lacus, at sollicitudin massa augue non diam. Quisque vitae lorem laoreet, pretium turpis in, cursus arcu. Sed vel venenatis odio, at dapibus libero. Integer non risus rutrum dui porttitor auctor vitae in turpis. Vivamus sed purus vitae lacus fermentum euismod. Quisque bibendum non felis ac varius. Nulla eleifend fermentum nulla, vel ullamcorper odio facilisis id. Hire a Licensed Contractor: Click below to visit CA Contractors State Licensing Board for more information! Click to hire a Licensed Electrical Contractor! Fusce sapien erat, eleifend eu pulvinar vel, maximus id ipsum. Morbi dapibus nunc leo, a egestas nunc porttitor vel. Aliquam malesuada ipsum est, maximus blandit orci condimentum lobortis. Phasellus dictum quam metus, ac efficitur velit varius quis. Praesent porttitor dui et risus maximus, vel porttitor odio iaculis. Pellentesque sit amet libero ut nibh porttitor condimentum ac ut augue. Nunc blandit ex nec justo tempor posuere. Morbi lobortis mi diam, at efficitur nunc condimentum a. Sed vel massa cursus, convallis eros et, sodales odio. Proin tempor congue neque id iaculis. Where subject to physical damage, conductors, raceways and cables shall be protected. The conductors (wires) that connect electricity to your hot tub must be protected from physical damage such as cuts or scrapes to the plastic insulation that covers the metal wire core. If the insulation is damaged, the wire can be exposed which can create electrical shock hazards and electrical fire hazards. Generallly, wire is considered protected if it's installed inside a wall, buried under ground or contained in conduit. Enclosure entry points...Aliquam viverra, sem ut accumsan cursus, turpis nisl ultrices lacus, at sollicitudin massa augue non diam. Quisque vitae lorem laoreet, pretium turpis in, cursus arcu. Sed vel venenatis odio, at dapibus libero. Integer non risus rutrum dui porttitor auctor vitae in turpis. Vivamus sed purus vitae lacus fermentum euismod. Quisque bibendum non felis ac varius. Nulla eleifend fermentum nulla, vel ullamcorper odio facilisis id.